Anyone who has a partner that snores will tell you that noise cancelling headphones for sleeping are a necessity. 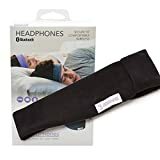 Even if you don’t have a snoring partner and you’re just a light sleeper, these headphones will prove beneficial when it comes to preserving your sleep and sanity. They help tocancel out the noisearound you so that you can sleep in silence. First, lets get one common misconception out of the way. There are two types of noise reduction that are used for headphones. There is the so called noise cancelling, and there is noise isolation. Noise Isolation.This is the type that most people refer to when they say “noise cancelling”. There is a difference, however. Noise isolation prevents unwanted sound by physically blocking it out. This can be done by pressing against or around the ears. Noise Cancelling.This is a more advanced type of noise reduction. Headphones withnoise cancellingattempt to actually cancel the soundwaves electronically. This type of headphones can be very expensive, and to tell you the truth – often unnecessary. Noise isolation gets the job done in most cases. Assumingyou don’t sleepnext to a construction site, noise isolation should definitely do the job. There are two main kind of noise reduction headphones for sleeping. The first type is made out of fabric. These headphones block sounds from entering your ears via noise isolation. The second type is the more high-tech type, with electronic noise cancellation. The type you choose to purchase will mainly depend upon your budget, and the level of noise you want to block. The main difference between the two types is their ability to block out external sound. Fabric headphones don’t block as much sound, but they are more comfortable. On the other hand, electronic noise-cancelling headphones are very effective at blocking sounds, but are not at all comfortable – especially for those who tend to sleep on their side. There aren’t as many noise cancelling headphones for sleeping out there as you might think. Nonetheless, we’ve made a list of the 3 most popular headphones below. Exclusive TriPort technology delivers better sound. Proprietary StayHear+ tips provide a soft, secure fit. These headphones come with the real type of noise cancelling, are comfortable to wear, and sound great. The Bose QuietComfort uses the StayHear+ tips to achieve a better fit. This results in them not falling out of your ears as easily as some of the other headphones. They are able to cancel quite a bit of noise, simply by isolation. Thus, they don’t have to be turned on to make a difference. Nonetheless, if the noise isolation doesn’t do the trick, you can simply turn on the electronic noise cancelling technology. Because the Bose comes with noise cancelling, you’re able to listen to your music on a much lower volume, without being disturbed. Here at Headfonic, we stress this issue. Do not blast your eardrums with a high volume. Your ears can get damaged! A great feature with these noise cancelling headphones is the remote control. It has a remote control located on the cable. It lets you turn on or off the noise cancelling effect, saving battery when you don’t need it. It also makes changing tunes in your sleepy state a breeze. There are a few drawbacks, though. These headphones aren’t as comfortable to wear for sleeping as the Tooks below. Additionally, they come with a pretty hefty price tag. Nevertheless, if you need something that has that extra noise cancelling effect, then by all means, these are the headphones you’re looking for. 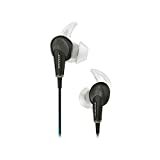 The Bose QuietComfort is a great set of headphones, and they should definitely last you a long time. These headphones are made out of fleece. They are the poster child of comfort. With the Tooks, you don’t have to worry about sleeping on your side. The headphones are removable, if you just want to use it for the sound isolation. The Tooks don’t have the noise cancelling feature that the Bose does. In fact, these aren’t that great for cancelling out large amounts of noise. They do, however, cover your ears, and provide some noise isolation. If you need to block out loud noises, the Bose is for you. However, if you don’t need to block a world of noise, but simplyenjoy falling asleepto your favorite tunes – then these might be perfect for you. The quality of the sound isn’t fantastic, but its decent. After all, we think comfort is more important when it comes to sleeping, than the quality of the sound. These are by far the most popular headphones of the three, judging from the costumer reviews on Amazon. They are very comfortable to wear, and make falling asleep while lying on the side frustration-less. They have a modest noise isolation (not noise cancelling). They should be able to block a lot of the low volume noises, especially if you’re listening to something while you fall asleep. The SleepPhones come in three difference sizes; small, medium (fits most), and large. They are developed by a family physician, and have become quite popular over the years. Again, if you need to block out heavy noise, the Bose headphones are a better choice. On the other hand, if you’re looking for a comfortable pair of headphones to use while sleeping, look no further. There are a few things that you should consider, when searching for a new pair of sleep headphones. We’ve listed some of the most important ones below. You’re going to want to choose a quality pair. You don’t want them breaking very easily. They need to be comfortable. If at all possible, try them on to see how they fit. You want to make sure that you’ll be able to wear them for a long period of time without them growing uncomfortable. Also, keep in mind that wired headsets are easy to get tangled up in while you sleep. Don’t forget to check out the battery life (some sets of headphones do better than others here) and warranty. It’s a good idea to go online and actually search for some reviews of the headphones you’re considering purchasing, before you actually buy them. When doing so, don’t just look at what people are saying about the headphones themselves but also what they’re saying about the company’s customer service policies. You want to make sure that you’ll be able to get in touch with them if you ever need to do so. Noise isolating headphones are able to block out the majority of unwanted noise around you. This is something that most people are happy to discover. There are, of course, some limits as to the types of sounds that they block out, but for the most part, they do just fine. A lot of people have been trying to overcome the noise around them with high levels of music. This isn’t necessarily because they want their music to be at that level but simply because they’re trying to drown out the external world around them and get some peace and quiet. With noise isolating headphones you won’t have to experience this. You can actually block out a lot of the sounds around you without having to replace them with even louder sounds. This is great news if you’re at all concerned about the health of your ears and your hearing. Not only are noise isolating headphones great when sleeping while others around you are finding the need to be noisy or snore, but they’re also great if you’re going to be traveling. With noise isolating headphones you can travel on a plane or a train, and block out the noise around you, so that you will be able to read, study, work or even sleep. While these environments can be noisy, since they’re filled with people and the noises of the vehicles themselves, you can still preserve your sanity. This is great news, especially if you spend a great deal of time traveling. In the same way that noise isolating headphones are ideal for traveling, they’re also ideal for studying. There are a lot of students, especially those who live in a college dorm room, who find themselves being easily distracted by the constant noises around them. In the past, this simply meant that you’d need to turn up the volume on your stereo in order to be able to block out distractions so that you could study better. Some have even tried to turn off their headphones, while still leaving them over their ears to block out sounds. Most of the time, though, this will result in a humming that can be even more distracting than the music or sounds around you. Instead, you could be using noise isolating headphones to block out the sounds from the external world. It should give you a higher level of concentration, making learning less of a chore. There is some debate about whether or notlistening to music while studyingreduces learning ability. Ultimately, it doesn’t matter what pair of noise cancelling headphones you use for sleeping. You should never expect them to perform miracles. Even the best pairs aren’t going to be able to block outeverything. You’re still going to hear high-pitche sounds, abrupt noises and sharp pitches too. Nevertheless, they are still going to be able to help you get a better night’s rest. Even if you have to sleep next to someone who snores all night long, and that’s what really matters the most here.